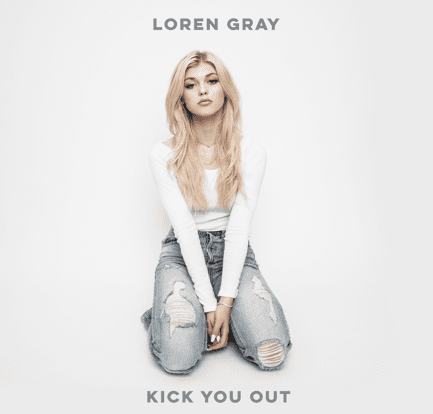 16 November 2018 (Toronto, ON) - Self-made phenomenon Loren Gray releases a new single, “Kick You Out,” today via Virgin Records/Universal Music Canada, the country’s leading music company. The official video for “Kick You Out,” directed by Jake Wilson, also debuts today on YouTube HERE. Loren wrote the treatment herself and invited her friend and fellow performer Grant Knoche (Nickelodeon’s Nicky, Ricky, Dicky & Dawn) to appear in it with her. “Kick You Out” introduces the world to 16-year-old Loren’s distinct brand of pop: edgy, stylish, unapologetic, and empowering. Made with Ido Zmishlany (Shawn Mendes, Demi Lovato), “Kick You Out” is darkly charged but built on brightly infectious beats. “It’s about trying to forget about someone,” Loren says. "I was feeling really vulnerable, and the song came right from my heart." Loren has been obsessed with music her entire life. Growing up in the Philadelphia area, she began playing piano at a young age and spent her childhood listening to everything from classic rock and country to heavy metal and hip-hop. At 15, she uprooted herself and moved to Los Angeles to pursue a career in music. After cutting six records as an independent artist, Loren landed a deal with Virgin Records in early 2018. In August, she released “My Story,” which debuted at #1 on the Spotify Global Viral Chart and has racked up more than 5 million streams. Loren is currently at work on her debut EP. Listen to “My Story” here.